PORTLAND, ME--(Marketwire - Sep 13, 2012) - Kepware Technologies, the leader in advanced automation for communications, today announced the City of Orlando is solving its most difficult industrial automation challenges leveraging the company's advanced communications platform. The city has integrated KEPServerEX® to resolve potential issues associated with its new water reclamation project. View the complete City of Orlando case study. With more than 1.4 million people, the City of Orlando is home to some of the most fertile agricultural areas in Florida. As one of the world's fastest-growing cities, Orlando has the ninth busiest airport in the U.S. and is a center for digital media and bio medicine. With an ever-increasing population, the city faced an immediate, growing need for water services. "Orlando is home to a growing number of residents, but we're also experiencing a dramatic influx of new corporate headquarters to our region. While this is great for the state, it caused significant challenges in the supply, distribution and management of water," said Guy Mecabe, City of Orlando, Waste Water Systems Manager. In response to numerous issues, Orange County and Orlando began developing an integrated water reclamation project. 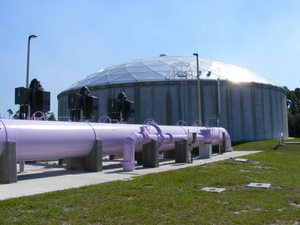 The Eastern Regional Reclaim Water Distribution System provides reclaimed water to a broad base of commercial and residential customers. As the state's first reuse project -- and one of the largest in the country -- the systems provide approximately 28 million gallons/day of reclaimed water for crop irrigation. Upon installation, the team noticed the system caused four separate pump stations to compete for water pumping rights at the same time. This created significant competition and caused problems with pressure and maintenance. This disjointed communication and lack of real-time updates meant system managers were required to manually collect water management data from two separate platforms. It also caused both the County and City to experience missed revenue opportunities -- as each were basically "selling" water through the system and each was only compensated for water delivered. The answer was found in Kepware's KEPServerEX. It is specifically engineered to connect disparate devices and applications -- from plant control systems to enterprise information systems. The flexible and scalable software easily manages monitors and controls diverse automation devices and software applications. Communications are managed through a robust platform that supports an array of open standards. Upon installation, integrated communications were immediately established. Both city and county operators were able to view all pump status, valve positions, flows, tank levels from each individual pump station. Mecabe says this real-time information permitted operators to handle immediate decisions relating to operation and maintenance: "Since the implementation, there's no need for anyone to call -- as they have all the real-time information necessary at their fingertips." Kepware Technologies, established in 1995, develops a wide range of communication and interoperability software solutions for the Automation industry. Our flexible and scalable solutions are for connecting, managing, monitoring, and controlling diverse automation devices and software applications. Our industry endorsed software solutions improve operations and decision-making throughout all levels of an organization. Kepware Technologies' mission is to be "Your Standard for Connectivity."